From top down: Green velvet pig, $148, the Cottage, Tiverton. Brown velvet poncho, $98, Simple Pleasures, Providence. Pink velvet bag with tassel, $64, Rochelle’s, Newport (with locations in Watch Hill and Mystic). Small floral embroidered pillow, $185, and medium green faux bois velvet pillow, $280, both from the Cottage. Large navy velvet pillow with ribbon trim, $225, Lou Lou’s Decor, Newport. 24-inch colt bench in walnut, $680, O and G Studio, Warren. 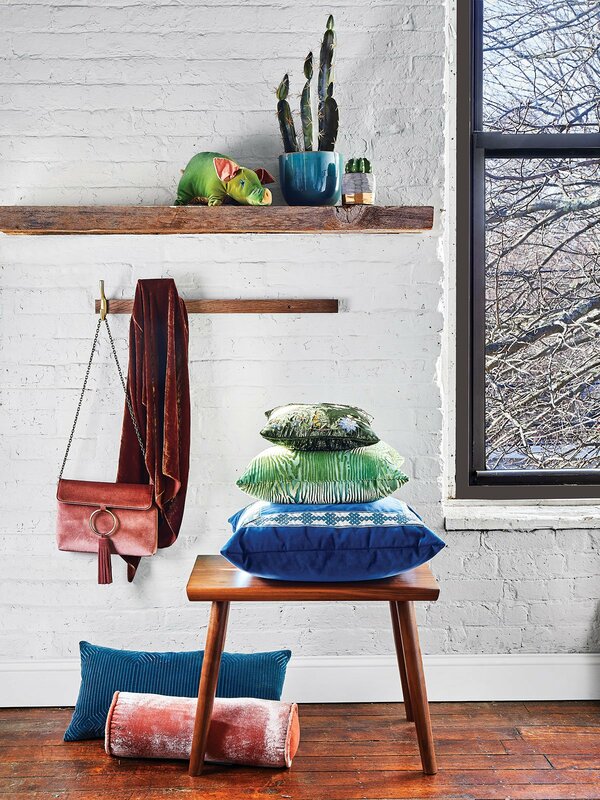 Teal rectangular velvet pillow, $130, Lou Lou’s Decor. Pink velvet bolster pillow, $175, the Cottage. Green floral velvet dress, $158, Feminine Fancies, Barrington. Mustard velvet clutch, $54, Rochelle’s. 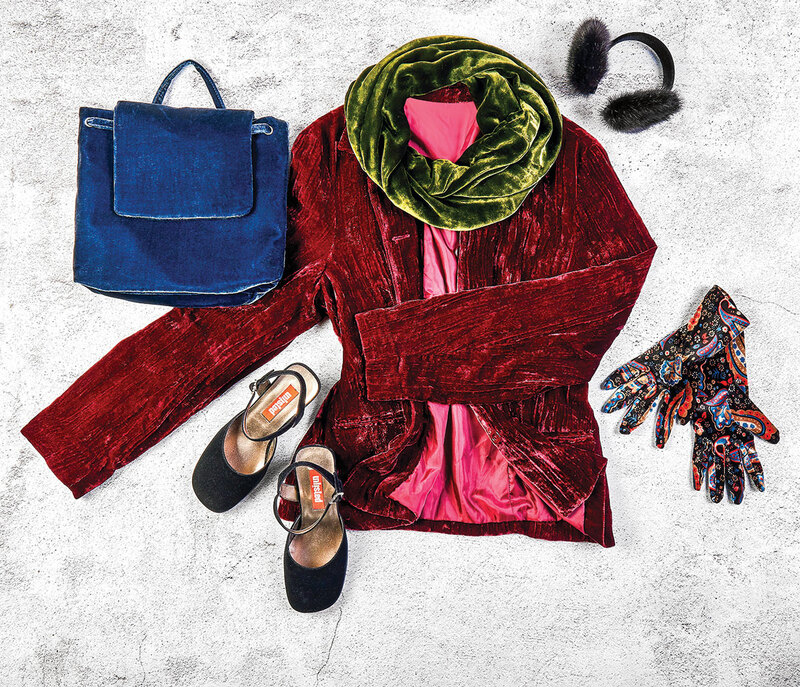 Clockwise from top right: Velvet and fur ear muffs, $80, Feminine Fancies. Cranberry crushed velvet vintage jacket, $35, Lore, Providence. French paisley velvet gloves, $46, Simple Pleasures. Black velvet vintage Mary Janes, $30, Lore. Blue velvet backpack, $72, Simple Pleasures. Olive velvet infinity scarf, $49, Grasmere, Bristol. Blue velvet scarf, $56, Simple Pleasures. 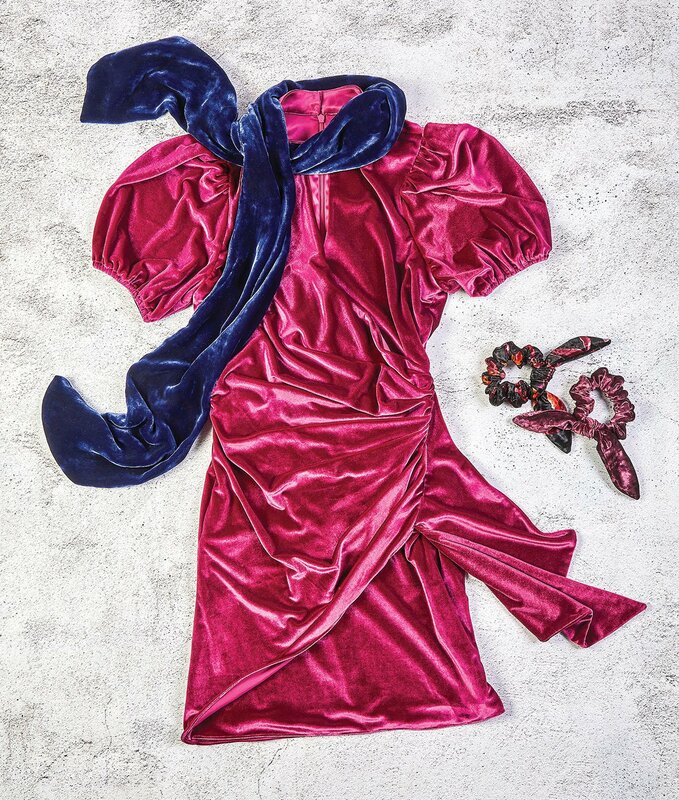 Magenta velvet dress, $278, and velvet hair ties, $22 each, all from Kristina Richards, Newport.